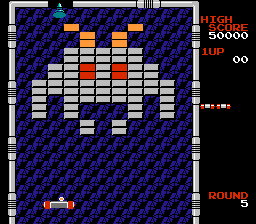 Arkanoid is a brick-breaking game that was originally released in the Arcades in 1986. There's 36 rounds that support either a standard controller or the Vaus spinner controller. The object is to continually bounce a ball off your spacecraft in order to break all of the coloured and silver bricks. In a nice twist, capsules occasionally fall from broken bricks, and if collected they give you super powers such as the ability to catch the ball, split it into three, or even fire a laser to smash the playfield to pieces. The latter is satisfying (helping you clear bricks much quicker) and the weapon system is a really great advancement for the genre. The stage design is a mixed bag; on one hand, Round 5's Space Invader layout is a treat, as is Round 10's L-shaped section where you wedge the ball inside and look to split it into three for utter carnage! Others are less fun, particular Round 3 with its low barrier of unbreakable bricks (in my opinion, this is too challenging for an early stage), and most of the later tedious rounds where every single brick needs to be hit multiple times. The challenge is wildly uneven throughout and the game really could have used some difficulty settings; using a Vaus controller does help due to its variable speed (the one-speed movement of a standard controller is useless) but even then, seeing past the opening rounds is tough. If you do manage to progress to the higher rounds, it's hard not to shake the feeling that you've seen it all before, and the level design starts to look very similar. The only respite is the inspired Round 36 where you manoeuvre your ship to avoid being shot by a boss; it's a wonder why the developers didn't add more of these to break up the action! Arkanoid is a great update of the classic Breakout formula, but it's hard to enjoy the game when it repeatedly beats you over the head with its extreme difficulty. In my opinion, there are Arkanoid clones, such as Crack-Up! (1989, Atari 8-bit), that do a much better job of balancing everything in a more player-centric manner. Random trivia: The Famicom version only has 33 rounds and features tougher stage design (e.g. Round 3 has more unbreakable bricks on the bottom row).